Let’s discuss a good common sense strategy that we can use to get YOUR house sold for top dollar! Use the Real Estate Comps! Whether you are selling your house, or looking at a house that you are interested in buying, understanding “The Comps” is an important part of the process. If you use comparable sales data correctly, you will know that you are selling (or buying) your house at an appropriate price! Price Your House Right! 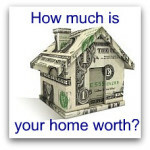 Some agents will inflate the value of your house just to get your listing! Listing with that agent will NOT be in your best interest! (Click Here to find out why!) Pricing your house correctly will help to insure that your house sells for TOP DOLLAR! Economics 101: Ultimately, the market will decide the correct sale price for your house. It is best to list your house at the correct price from the beginning! Before you put your home up for sale, use the comparable sales data to find the perfect price. Knowing how much homes similar to yours, called comparable sales (or in real estate lingo, “The Comps”), sold for gives you the best idea of the current estimated value of your home. The art is finding sales that most closely match your property and using the sales data to accurately price your house. What makes a good comparable sale? An active agent has been inside a lot of homes in your neighborhood and knows all sorts of details about comparable sales. She (or he) has read the comments the selling agent put into the MLS, seen the ugly wallpaper, and heard what other REALTORS®, lenders, closing agents, and appraisers said about the comparable sale.